An author living in the present day (2005). He is the only survivor of the mass disappearances on Yamijima 29 years ago, having been discovered drifting in the sea on a small boat the day after experiencing a night of terror on the island. At the time, he had lost his vision and memory of the night due to shock. Losing his mother at the age of 1, and his father in the mysterious happenings on Yamijima at the age of 4, Mikami was taken in by relatives on his father's side and raised on Tokyo. Since his adoptive parents were relatively wealthy, Mikami was able to graduate from university despite his visual handicap and, whilst late on, make his debut as an author. His maiden work received critical acclaim, turning him into an overnight star. Mikami's novels are always based around the same theme of a phantom girl, which is a projection of the Kanae who still inhabits Shu's childhood memories. Mikami himself seems to have said that he suffers from amnesia despite occasionally recalling fragmented memories, such as his happy life on Yamijima and the girl he met there. As he writes his semi-autobiographical novels, Mikami gradually begins to stop suppressing his longed-for memories, heading for Yamijima, where he was brought up, for the first time in 29 years with his pet dog Tsukasa, in order to uncover the mystery of his lost sight and the memories of the girl There, though disbelieving, Mikami becomes caught up in an "oddity" just like back then. On the illusionary Yamijima, Mikami follows the memories that begin to return clearly to him, removing the seals on the seven gates. Descending to the Netherworld, Mikami reunites with a hallucination of the Kanae he has been searching for, and is sucked in by Mother. She steals his flesh, and the now ghostly Mikami gradually begins to act as his younger self, wandering around the island in search of Kanae. At the end of the story, the young Shu appears at the Singularity, drawn in by his childhood attachment to his medal. In response, Kanae (Akiko ver.) appears - after 29 long years, the two are finally reunited. On the BBS on Shu Mikami's official site, actually viewable on the internet, you can see that after Mikami set out for Yamijima he vanished. Since the incident occurred right off an appearance on a variety show (broadcast on 23/7) and a feature in an interview that brought him a lot of attention, the wonderings oh the site's maintainer and the support of fans and thoughtless remarks proceed in real time. The BBS itself was shut down on 9 February 2006, and currently no longer updates. Romance novel "The Mermaid's Tear"
Part of Shu Mikami's novel can be read in Sleep Walker on the official website. It seems more like pure literature than a romance novel...? After the Shoseimaru is capsized and Mikami is tossed overboard into the red sea, he is thrust through a "fold in time", a world where spacetime has completely collapsed, all alone. 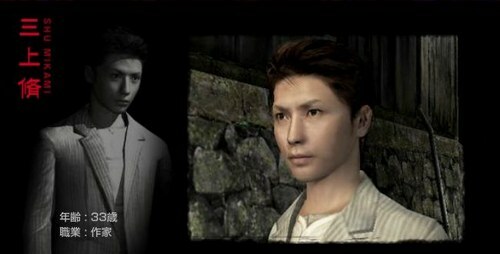 Using Tsukasa's vision, Mikami views his lost memories (the night of the tragedy). The reason his Shibito-turned father Ryuhei appears to ignore him is because Mikami is in an unstable state within spacetime - a fold in spacetime - and can't be seen by him. What causes this odd experience to take place is the strengthening of the link between Mikami and Kanae bringing his memories back. Pulled in by a hallucination of Kanae (shown to him by Mother), Mikami's flesh is stolen, and he remains only as thoughts. He becomes a spiritual being that exists in places all across Reflected World Yamijima, remembering everything. Searching for his beloved Kanae, he wanders the island in the mental state of young Shu, guiding those connected to him. Abe finds and looks after Mikami as he wanders the island alone after losing Tsukasa and then assists Mikami in the descent to the Netherworld (each person must unseal the "seven gates" for themselves). Influenced by his memories from when he was alive, taking a liking to Abe for being honest with no underhanded motives, the ghostly Shu helps Abe in several ways. A: Mikami was never that good with other people - or should I say, was never interested in them. His promotion, including his odd fashion sense and highlighting of his good looks, was really directed by those behind him, wanting the author Shu Mikami to sell books. Mikami doesn't really care enough to reject it, though. There is a woman who manages his the official Shu Mikami website (called Kimiko Takahashi), and she is meant to be one of his producers. Q: Why did Mikami lose his sight? A: Because he saw Kanae melting into the sea. It was a combination of that and the psychogenic shock from witnessing something so taboo. Q: In objective 2 of 3:00 "Stand-In", Mikami discovers a fossil, but what is it? A: It was dragged in by chance in the flow where (something that transformed from the bones of) Annaki = Mother = Kanae. Q: After Mikami is left alone in -2:00 "Chance Encounter", and until he is saved by Abe in 3:00 "Stand-In", there is quite a blank gap (5-6 hours), isn't there? A: This is because he was sucked into the Reflected World via the overlap in time, and therefore the passage of time is messed up.